One of the great joys of traveling is to head to the local market to let yourself be carried away by the sights and aromas of foods you may have never encountered. The bustling activity almost makes you dizzy, as you watch the child-like excitement of fellow shoppers as they crowd around each new seasonal item making that once-a-year debut. 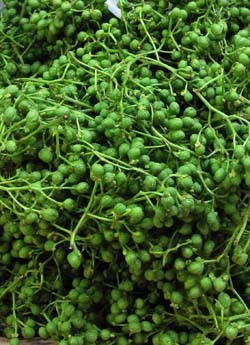 This time of year, one of true seasonal delights is sansho no mi, the seed pods of the sansho (Japanese pepper) plant. You can recognize them by their lively bright green, berry-like pods that completely cover comparatively delicate stems. Try them if you dare – for they burst in your mouth with intense spicy flavor and have a pleasurable (and surprising) tongue-numbing effect. But do try them, for fresh sansho no mi is not commonly available outside of Japan and is a rare (and some say, addictive) treat. Watch your fellow shoppers as they carry away bags of aromatic green seed pods, not only to enjoy now, but also to preserve and enjoy throughout the rest of the year. 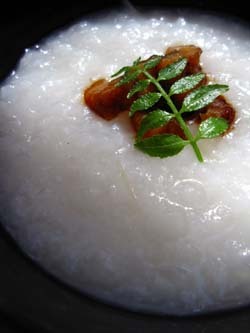 The seed pods can be simmered with soy sauce or blanched and salted, and are often mixed into chirimen sansho, a popular mix of spices and jakko (a small fish) to eat on top of rice. 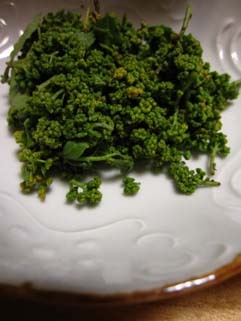 Sansho is a particularly useful deciduous tree that belongs to the tangerine family and grows wild in Japan (as well as in some parts of China and Korea), and almost every part of this aromatic and versatile bushy plant is edible. The Japanese love sansho in all its forms, and its subtle cuisine benefits from the pepper’s powerful, clean flavor. In the spring, the soft early growth, the two-inch ends of the branches — called kinome, literally meaning “tree shoots” — is gathered for its heady fragrance, refreshingly citrus-like flavor and visual beauty. 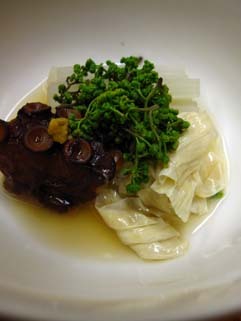 You can spot kinome on top of simmered vegetables like fuki (butterbur) or takenoko (bamboo shoots), lending their heady fragrance to soups or garnishing full-flavored, intense dishes such as simmered tai (sea bream) heads. Kinome provides the perfect contrast to oily and rich foods, but they also taste wonderful with sashimi. 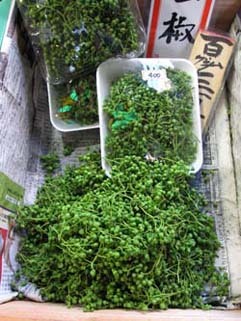 In early May, there is also a short-lived season for hana sansho (sansho flowers), which have a more intense spiciness than the leaves but are milder than the pods. They are also lovely to look at, populating delicate branches with a profuse display of bright green, tiny flowers. 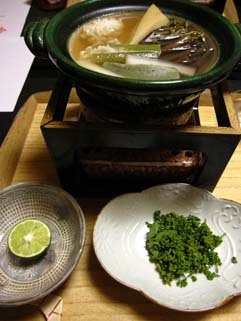 They can be added to nabemono (simmered dishes) to impart a wonderful and unique spiciness, or as garnishes to evoke the late spring season.